My boyfriend is the hardest person to shop for. It’s because he never tells anyone what he wants, he just buys it himself. (And I’m over here dropping hints like crazy for every holiday under the sun). We went to the mall a few weeks ago and stopped in the Fossil store where Drew spotted a bag that he loved. 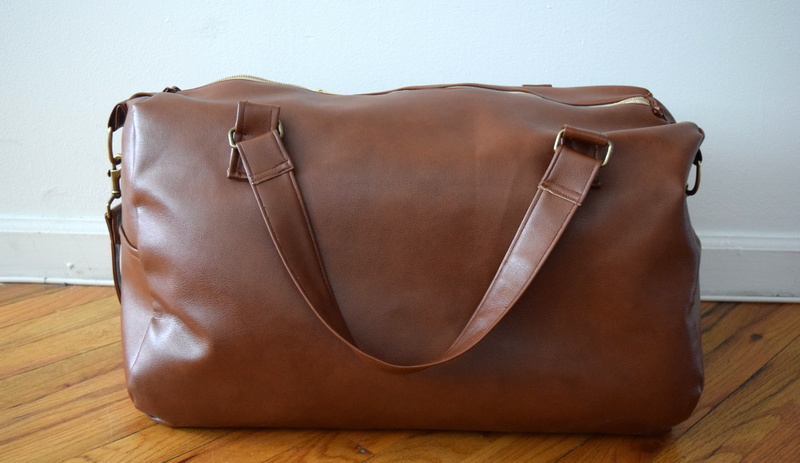 He needed a good weekend duffle to use for business trips instead of his gym bag and he really liked this one. He said he was going to think about it before dropping $400 on it. I forgot all about the bag until his birthday was fast approaching. 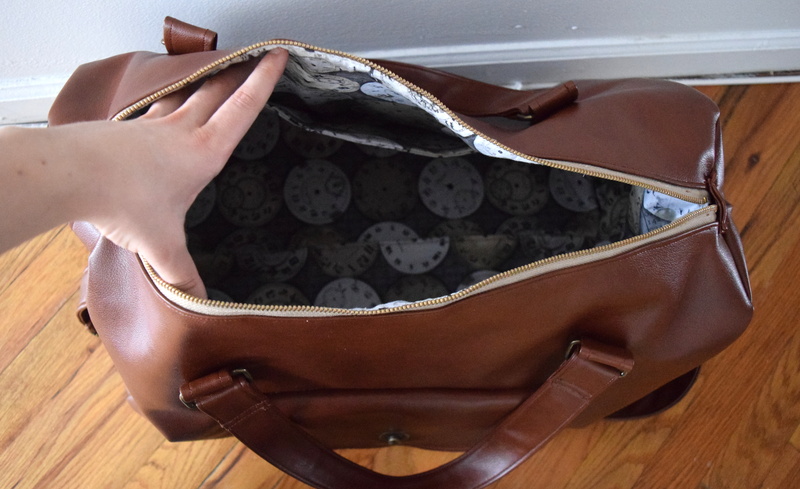 I had a pattern for a duffle that I’ve always wanted to try (Simplicity 2600) and with a few adjustments, it could look pretty similar to the fossil bag! 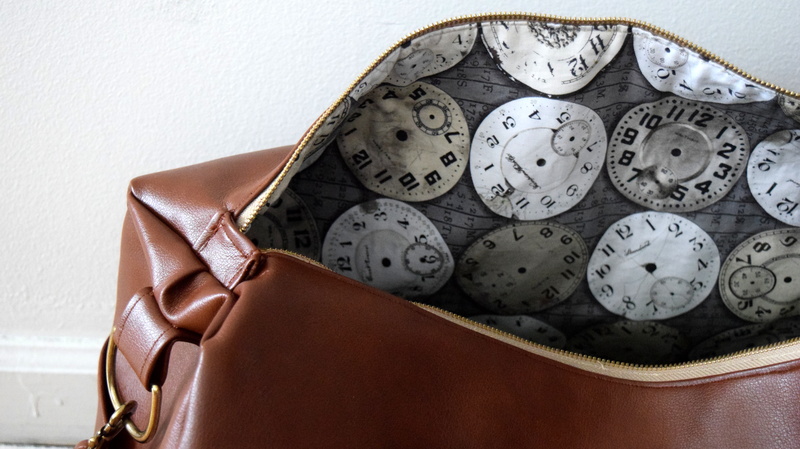 I started with two beautiful yards of faux leather from Joann’s and an awesome clock face print for lining. Drew has a slight obsession with watches so this was perfect! I had a general idea of the changes I wanted to make and how to construct them with the existing pattern. I cut out the body pieces but not the straps the way the pattern called for. I also didn’t make any of the piping and added a flap over the front pocket which was one of the scariest parts to sew. I didn’t know how my machine would handle the layers but everything went smooth! I did break about 3 needles when sewing on all the straps but they are on… and secure…I hope. I finished the bag just in time for his birthday and it even accompanied him on his trip to Miami this past weekend, and it held up well! He was so cute when I gave it to him. He freaked out and asked where I got it. When I told him I made it-he flipped! He couldn’t believe it! That is the greatest compliment a seamstress can get so I’m very happy with the result! Fossil ain’t got nothing on me! I’ve gotten numerous questions about tutorials and where to find materials so I hope this post edit will help you lovely readers out! Many people have asked for a template but since this is a sewing pattern, I cannot give you a template to follow. (I also don’t want to get into any trouble providing you with the pattern pieces these pattern makers worked very hard to make!) There are a few online patterns that you can modify to get a similar result, but I would definitely invest in the true pattern (or a similar one) for this project. I bought the fabric from JoAnn Fabrics because it is one of the closet stores to me. 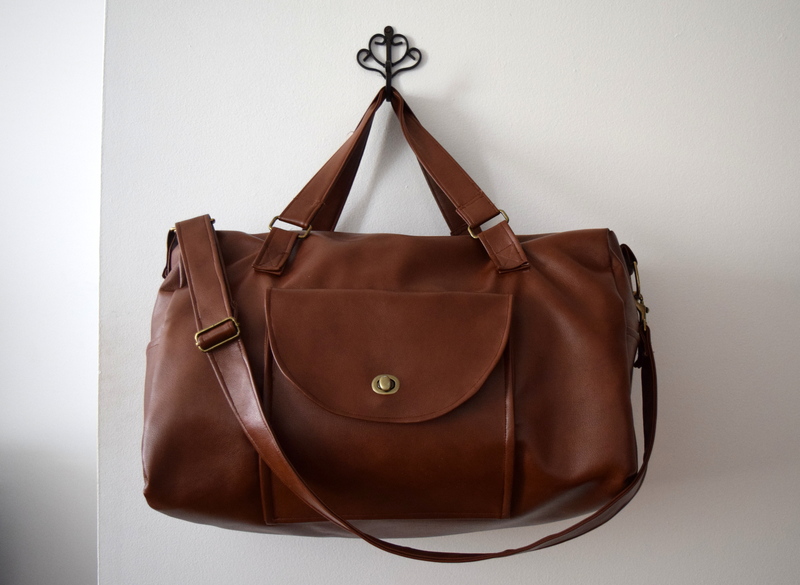 I used vinyl for a few reasons: It is cheaper than leather (and looks just as good) and I do not like using animal products, so vinyl is a great alternative. Cotton lining is just regular quilting fabric, I did add a layer of very thick interfacing for strength. 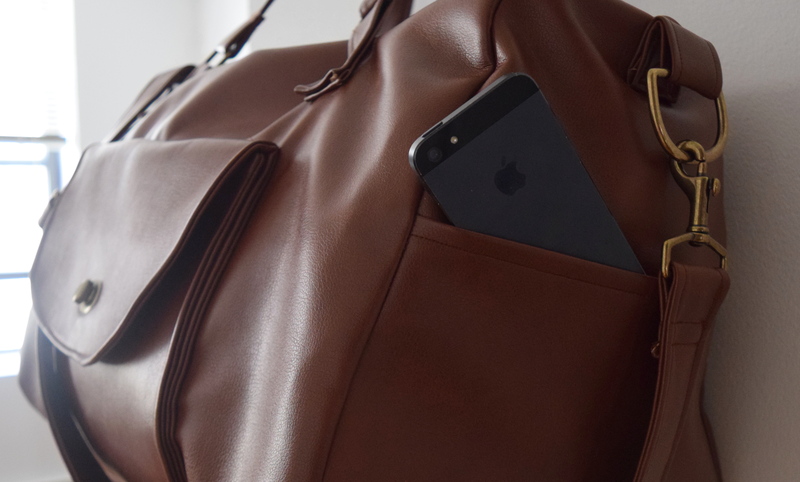 Front Pocket: The front pocket is ultimately a large rectangle with a curved top. Before sewing the rectangle onto the bag it measures 26″ x 10″. Straps: I completely omitted the straps on the original bag and added two shorter straps (19″ long each) and one shoulder strap (45″ long). That’s it! Personally, I think it is the fabric that makes the bag what it is. Taking any pattern you want and making it in a faux leather will probably get you great results. 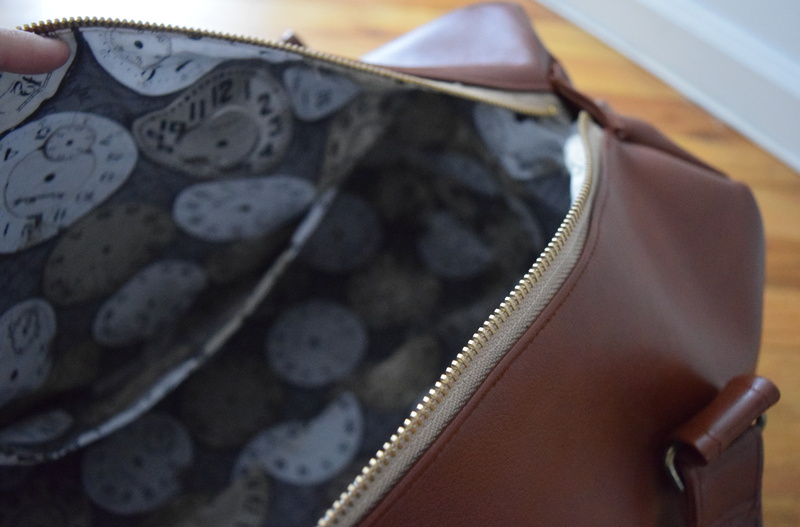 I hope these tips and links help you to create your own bag! It is the greatest compliment! And this bag is absolutely gorgeous! You’ve made me want to make one now, :). This is gorgeous! I love how it turned out. I’ve been wanting to make a weekender type bag myself, but haven’t gotten around to it yet. Thanks! A duffle is something I’ve wanted to make for a while, didn’t think I would make one for someone else first! This is a good size bag if you are in the market for a pattern, I’ve also been eyeing Amy Butler’s weekender, but hear that one is crazy hard! I love the lining too. Your boyfriend is very lucky to have you! An awesome bag, and Drew’s reaction sounds adorable! I’ve been feeling a little disappointed recently that my boyfriend is no longer amazed by every single thing that I sew, but then he freaked out over some patch pockets and all was well with the world. if you’d like to be included, please respond ASAP. Just sent you an email! Thanks!! Hi there Nena! Thank you! What site are you coming from? This is made from a Simplicity pattern so you can certainly make it yourself! How hard was it to do/how long did it take? How much did your version cost to make? And could a pattern like that be adapted easily (like changing the placement of the main zipper, etc.)? Since I followed the Simplicity pattern and have a pretty good background in bag making, it wasn’t too difficult but does require patience! haha. I don’t have an exact time to give you but a few days of on and off sewing is how long this took me. My version cost about $80 between fabric and hardware (not including any labor costs here because that price would go sky high pretty quick!) Adapting the pattern shouldn’t be too hard, but if you are trying to make major changes, test it out with a muslin version first. Would you be able to tell me what site led you to my bag? Thanks! Thanks! And I found it on Buzzfeed.. they just did a list/article that featured it (it’s #11.. http://www.buzzfeed.com/kollabora/vacraftion#.xcYNgPlPg) – well, the link sent me to Kollabora which then sent me here. Can you give me a link to the simplicity template you used? Also where did you buy the fabric and hardware from? Hirai, Thank you so much! WordPress wasn’t letting me know where everyone was coming from! Unfortunately it isn’t a template but a pattern, Simplicity 2600. You can purchase it online or in a craft store. I’m sure you can find similar patterns online for free if you google search for them and just make some changes! The fabric is from JoAnn’s, It’s a beautiful faux leather, the watch interior is also Joann’s. I bought most of my hardware from a few wholesale places since I make handbags for a living but all hardware pieces should be available in your local fabric store. The best place to go online for all your supplies is Joann.com, the coupons are great and you can get everything you need there. I hope this helped, thanks for stopping by my blog! This idea is lovely! 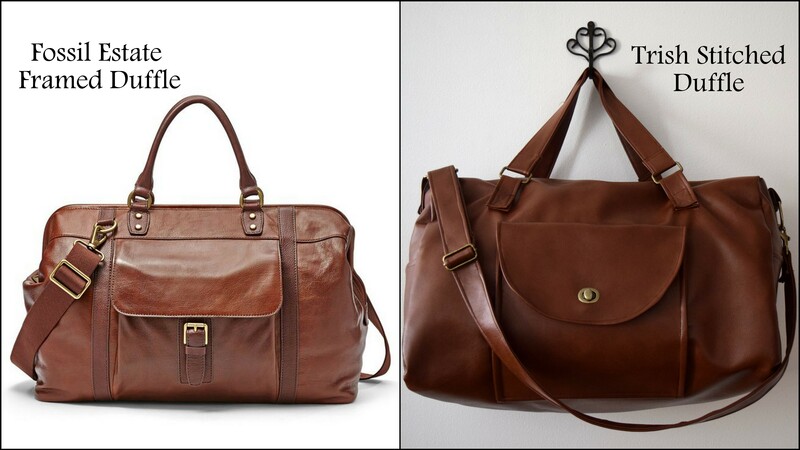 Would you recommend any brand names for the hardware part of the bag? Thanks Sarah! Whatever I don’t get wholesale, I normally pick up Everything Mary pieces from JoAnn Fabrics. I just updated this post with two links for hardware and a list of all supplies used, hope it helps! if you want to square up the vag a bit like the original, cut a piece of Plexiglas the same size as the bottom of the bag this could be covered with your lining fabric or left as is. Place the Plexiglas in the bottom of the bag and it will provide it with a firm foundation on which to sit.